The end is here. The lines for the final battle have been drawn. The forces of hope seek to save the world and bring about a new one, but it seems even old allies have joined the forces of despair to snuff out the light once and for all. Alice, Millium, and Kaguya lead the final, desperate charge against the overwhelming power of the enemy, now aided by former comrades. Is the only way to save the future to embrace destruction? Lapis Cluster 04 Booster Set contains all new unique and interesting cards, including rulers, magic stones, resonators, spells, and additions. Never before seen powerful mechanics! Special preorder bonus available! 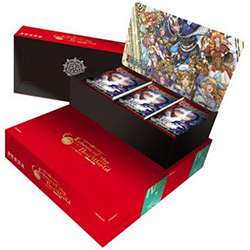 Preorder the Force of Will: Lapis Cluster 4: Echoes of the New World Booster Display (FOWBPL4) now!